Travelling with kids to the “Land of the Hornbill” has become more popular nowadays. Sarawak Borneo is rich with green tropical rainforests, teeming with rare species of flora and fauna;- from the carnivorous pitcher plants and the rare Rafflesia flower, to the cute orangutans and proboscis monkeys. Traveling with your kids to Sarawak Borneo will let them gained a once-in-a-lifetime experience. To help you plan your holidays in Sarawak Borneo, we bring you 6 kid-friendly destinations in Sarawak Borneo to go to during the summer holidays or spring break. Feel free to bookmark our article and read it again when the holiday comes around! The fascinating capital city of Sarawak Borneo, Kuching City offers many travelers with many ethnic tribes, history, and interesting places to discover. Not forgetting, the fantastic fusion cuisine of Kuching City awaits you and your kids to indulge. Walking around in Kuching City is suitable for your children, not only is it safe, but clean too! (You won’t get to see a single trash on the roads!) Don’t forget to bring your kids to experience river cruising along the Sarawak River using a wooden boat or tambang and get to explore every aspect of this historic riverine capital. Want to take a walking tour of Kuching City? Read our article here. The word Kuching means “cat” in Malay, which is why you’ll get to see many statues of cats around the town area and it can be a good photography subject for a family portrait. Apart from that, if any of your kids (or yourself) is a cat-lover, take a trip to Cat Museum, which is located at the Kuching North City Hall. The Cat Museum exhibits many feline things, such as a collection of articles on cats, artifacts, cat statues, and figurines from all over the world, as well as cat posters and souvenirs. The good thing about it is there is no entrance fee but you do have to pay a small fee for bringing in your camera. Trust us, you will want to bring your camera inside as there will be many photo opportunities which can be taken there. It can be a quirky activity to visit Cat Museum, but there are also other quirky things that you can do in Malaysian Borneo. This outdoor museum showcases the traditional houses of various ethnic groups in Malaysia and Sarawak Borneo, such as Bidayuh, Iban, Melanau, Penan, Orang Ulu, Malay, and Chinese. Your kids will be given a ‘passport’ to get stamped while going for a relaxing stroll around the village and witness the traditional houses. Each traditional house showcases different types of demonstrations that include wood and bamboo carving, reed weaving, beadworks, pounding rice or crushing sugar cane, as well as other traditional activities. Don’t miss out to enjoy the multi-cultural dance performances in the village’s own theatre or let your kids experience blow dart. There also have few good restaurants and handicraft shops for you and your kids to have some snacks or purchase some local souvenirs to bring back home. Did you know that the Rainforest World Music Festival is a 3-day music festival which held yearly in Sarawak Cultural Village? Feel free to read our guide to Rainforest World Music Festival article. Let your kids experience Borneo Wildlife for your family holidays in Sarawak Borneo by visiting Semenggoh Wildlife Centre. A centre that is established for the purpose of rehabilitation and conservation for orangutans before being released back into Sarawak Borneo’s rainforest. This centre is about 20 km away from Kuching City, your kids will get the unique opportunity to get a closer look on the semi-wild orangutans from their natural habitat. The Semenggoh Wildlife Centre is not a zoo as the orangutans are not kept in cages and are free to roam around the thick, green forest. Therefore, orangutans are hardly seen around the centre as they are shy and reclusive animals. So, it is best to go there during the feeding times, which are at 9:00 am and 3:00 pm. The Bako National Park beaches can be seen above. Though Bako National Park is one of Sarawak Borneo’s smallest park, it is also one of the most interesting and diverse of 7 distinct plant ecosystems that can be found there! Your kids will love to explore the park as they will have the chance to see the iconic primate in Bako National Park, which is proboscis monkeys. Other Borneo Wildlife that can be found there will be the charming yet shy silver langur, Bornean bearded pigs, long-tailed macaques, flying-lemurs and more. In fact, wildlife encounters are almost guaranteed and it is perfect to let your kids experience it during your family holidays to Sarawak Borneo. Best of all, Bako National Park is only less than an hour from Kuching City, includes an enjoyable longboat ride across the bay. The largest national park in Sarawak Borneo and also Malaysia’s first World Heritage Area (awarded in 2000). It is known for its iconic limestone pinnacles, which somehow resembles Putangirua Pinnacles in New Zealand that was once a film destination for one of J.R.R. Tolkien’s famous fantasy novel; The Lord of The Rings. Interesting right? Other than that, the main attractions in Gunung Mulu National Park are the chamber caves ( Deer & Lang Caves, Clearwater Cave, and Wind Cave), bat observatory, rainforest canopy skywalk, adventure caving and Mulu Summit Climb. Bring your kids to experience the stunning show caves and the amazing bat exodus from Deer Cave, this is something that your kids will remember for the rest of their life! Travelling with kids is no longer a trend, but it is an absolute must-try! When you bring your kids to experience Sarawak Borneo, it eventually will open up their little minds with some of the exotic cultural experiences, discover Borneo Wildlife from their natural habitat, see the unique species of flower and plants in Sarawak Borneo, and explore the tropical Borneo Rainforest. Sabah Borneo is a unique place to visit, not only is it known to have many tribes living here, its diverse culture and tradition, but also the beauty of the places in Sabah Borneo as there are still many natural forests that are still left untouched and conserved. Not forgetting, the food in Sabah Borneo is to die for! It is so delicious that any travelers will certainly miss the unique taste of Sabah’s delicacy when they are back to their hometown. When visiting Sabah Borneo for Borneo Holidays, there will be several districts that we either pass through or encounter. We may find that the name of each district in Sabah Borneo is unique and special. Therefore, this article will explain to any travelers (and locals too!) the origin of the districts’ name in Sabah Borneo. First off, let us get to know Kota Kinabalu. Kota Kinabalu is the capital city of Sabah Borneo, which is located on the northwest coast of Sabah Borneo facing South China Sea. Formerly known as Jesselton during the British Colonization in 1800, it is a major gateway to explore the wildlife and nature in the northern region of Borneo Island. Kota Kinabalu is named after Mount Kinabalu (the highest mountain in Malaysia) and “Kota” which in the Malay language means fort, town, or city. Read our article on Traveler’s Guide to Kota Kinabalu. Next, we’ll go to the outskirts part of Kota Kinabalu City, which is Penampang. Sigah (headgear worn by Kadazan Men) Roundabout in Penampang, to symbolizes the Kadazan tribe. Home to one of the major tribes in Sabah Borneo – Kadazan, and is considered as part of Kota Kinabalu area. Penampang is derived from an old village that is within the district itself, the village name is “Pampang” derived from Kadazan dialect, meaning big rock. There were many big rocks found in the village a long time ago. Eventually, the term “Pampang” was changed into Penampang. Next, let’s ride down to the agricultural town of Papar, which is about 45 minutes drive from Penampang. Papar was originally ruled by the Brunei Sultanate. Thus, the name Papar comes from Brunei dialect which means a flat or open land. It is no wonder that Papar is known as an agricultural town due to many flatlands that are used for the purpose of growing rice and fruit orchards. In addition, if you’re feeling slightly adventurous, you can go on the North Borneo Railway Train to reach Papar, passing through the lush landscape of the coastal and rural regions of Sabah Borneo. Moreover, travelers can enjoy a typical ‘tiffin’ colonial lunch that will be served on the trip. Afterwards, let’s head to a small rustic town of Menggatal, located on the west coast side of Sabah Borneo and is under the jurisdiction of Kota Kinabalu City Hall. An old colonial building in Menggatal Town. Some locals might find Menggatal name is very funny and unusual, because the word Menggatal means flirtatious or provocative in Malay language. However, the people in Menggatal are not like that. The name Menggatal actually derived from a mango tree grown in the area, which is Mangga meaning mango, and Gatal meaning itchy in Malay language. So, whoever consumed the mango fruit, they will feel itchy as its side effect. Therefore, the locals there named the area as “Mangga Gatal”, but after awhile, the name somehow was shortened and became Menggatal. Next, let’s venture further up to Tuaran, which is about an hour drive from Menggatal. Drone view of Tuaran Town by Shariff Putra. The name Tuaran is believed to be derived from the Malay language, “Tawaran”. Tawaran has two meanings; the first meaning is freshwater, which refers to the abundance of freshwater in the area. Apart from that, another meaning is to bargain, as it is fact that trading activities had been taking place within Tuaran area before the British Colonization commenced in 1884. Locals from interior parts of rural villages will come to Tuaran Town to sell their jungle produce to the local communities that live in the coastal part. After that, let us get to know the land of the cowboys in Sabah Borneo, which is Kota Belud. Kota Belud is home to one of the tribes of Sabah Borneo, which is Bajau tribe. Its name is derived from a combination of one Malay word and one Bajau (dialect) word, Kota meaning fort, or city, and Belud meaning hill. There is actually a story behind Kota Belud’s name, in the past, there was hostility among the races of different villages in the area. Therefore, in order to defend themselves and to avoid enemy attacks, they decided to choose a hill as their fortress. Thus, the name of Kota Belud referred to as “Defense Fortress on the Hill”. Afterwards, let’s go uphill through the mountainous region of Crocker Range, where we will reach Ranau district, home to almost entirely Dusun tribe community. Ranau name is actually from the word “Ranahon”, which means rice fields in Dusun dialect. Most Dusun people who live in Ranau mostly cultivate rice paddy fields either on the hilly terrain or on the flatlands (for the interior part of Ranau). Sooner or later, the term “Ranahon” was shortened to become “Ranau”. In addition, to visit Ranau, a traveler should do these interesting activities in Ranau that should not be missed out! In a nutshell, getting to know the history of each district area in Sabah Borneo can be very interesting. However, it would be much more interesting and fun if travelers can get to spend their Borneo Holidays in these district areas of Sabah Borneo. Let’s Fly High with Tandem Paragliding! Don’t say YOLO if you haven’t gone to try the Tandem Paragliding in your Sabah Borneo trip! Enjoy the thrill and a sense of freedom of Tandem Paragliding amongst the breathtaking scenery of the Borneo rainforest. Soaring like an eagle while you paraglide with the professional, fully trained, and qualified tandem pilots. Your outdoor adventure starts after you are debriefed by your pilot and ready to fly. Be sure to witness the magnificent view of the villages and Borneo Rainforest, when you soar up high above the sky! Tandem Paragliding in Sabah, Borneo, has started for quite some years now, but recently it has become a popular outdoor activity in Sabah Borneo. As far as I know, there are two places that you can go for Tandem Paragliding in Sabah, Borneo, which is in Lohan, Ranau and Kokol Hill, Menggatal. You would need to know some of the rules and regulations before going through a tandem paragliding in Sabah, Borneo. Kids or participants (17 years old and below) would need to be accompanied by parent or guardian. Minimum weight is 30 kg and maximum weight 110 kg to participants who wants to join this. Apart from that, for those who have a height-phobia, it is not recommended to join this activity. No walk-ins available as this activity is not offered on a daily basis. You would need to contact the tandem master in advance and make full payment before your activity date. Luckily, Top Peak Travel could help you to arrange your travel and booking for the tandem paragliding in your Borneo trip. However, last minute booking would not be possible to reserve your tandem paragliding activity early. This is considered an extreme adventurous activity, thus, wearing proper and comfortable shoes is a must. Oh, and also some proper clothing as well. We won’t want the possibility of danger could happen during your tandem paragliding activity. Tandem Paragliding is not something everyone does all the time (unless you’re an extreme adrenaline junkie). It’s something that makes you squirm for the next few nights and keep you awake thinking, “Why in the world am I doing this again??”. But trust me, it’s something you will definitely want to try and enjoy. So don’t fret and most importantly, enjoy yourself! Let this whole new experience enjoy the wonders of what Mother Nature is giving us! Feeling pump up now? Contact us for booking and experience a sense of freedom with Tandem Paragliding! Traveling with kids? Read our Top 5 Kid-Friendly trips in Sabah Borneo. MUST eat in Sabah Borneo! Traveling to Sabah Borneo, you will find plenty of unique and delicious food. When visiting Sabah Borneo, don’t bother to go find food in any fast food, you can just simply go to any local cafe and eat like a local. Even the food is different from your usual taste, the food can be spicy, sweet and sour, too sweet or tang;, you will never forget the taste of Sabah Borneo food. Below is the list of the delicious food that you MUST eat in Sabah Borneo. Sabah Borneo is not only known for its famous mountain – Mount Kinabalu, which is the highest mountain in Southeast Asia, it is also one of the best places for Seafood lovers. You can easily find the freshest and good quality seafood served in any various eateries in Sabah Borneo. A visit to Sabah Borneo is not complete without you trying out the scrumptious seafood at the cafe or restaurants. Traveling to Kota Kinabalu, Sabah Borneo? Get yours now the Kota Kinabalu Travel Guide for FREE! Since Sabah Borneo is rich with seafood, it is no doubt that the local will serve the seafood with noodle. The Fish Noodle usually will be cooked with tomato-base (to remove the fishy taste) and you can have an option for your fish noodle soup to have milk inside or not. Whichever it is, both have different taste and are super mouth watering! Ngiu Chap or Mixed Beef noodle is the signature and one of the favorite noodle soup for the locals. The Ngiu Chap typically consist of noodles or rice vermicelli noodles in a beef broth soup with beef parts. Some shop will put radish inside the Ngiu Chap, however, the Ngiu Chap is highly recommended (together with our spicy chili). Simply scrumptious! Tuaran Mee is also considered Sabahans favorite noodle and it is a “MUST EAT’ noodle. It is originally from Tuaran Town, but now the Tuaran Mee can be found in any eateries in Sabah Borneo. However, the best is still in Tuaran Town itself. The original Tuaran Mee is served fried with Chun Kien (Sabah Pork Egg Roll), Char Siew and vegetables. Nowadays, there is also Tuaran Mee fried with beef or chicken meat, which can be served for Muslim. The Tuaran Mee specialty will be the fragrant and springy noodles, slightly smoky from the charring of the hot wok, and also you can taste the “eggy” aftertaste. Sang Nyuk ( meaning fresh meat noodle) is originated from Tawau, Sabah Borneo. The pork meat is usually thinly sliced and served on top of the noodle in the pork broth. You can eat the Sang Nyuk Noodles in either soup or dry stir. Some locals recommend the Sang Nyuk Noodle is best to eat with a dip of Hot Chilli Paste. When visiting Sabah Borneo, never missed out to taste the traditional food in Sabah Borneo , such as hinava ( pickled raw river fish), bambangan ( wild mango fruit), butod (sago worm), Tuhau ( Appetizer from wild ginger), bosou ( preserved raw freshwater fish) , and linopot ( Rice wrapped in leaves). It used to be so hard to find eateries that served the traditional food, as you will need to wait on certain occasion or Sabahan traditional wedding, then you will get the chance to taste the traditional food. However, D’ Place Kinabalu which is located at Shell Plaza, serves traditional food every day and you should try it out during your Sabah Borneo Trip! If you want to know more on the Sabah food or places to eat in Sabah, check out SabahEats website. 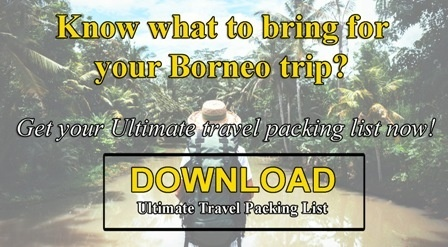 On the other hand, maybe you are looking for places to go in Sabah Borneo? Read our blog post on “Top 5 Day Trips To Do in Sabah Borneo“. Borneo Island consists of Brunei, Indonesia, and Malaysia (Sabah & Sarawak). It is the third largest island in the world and has become the choice of destination for tourists, especially for those who seek wildlife amidst the natural landscapes. Not only that, Borneo Island has some of the world’s oldest rainforests and a great tropical climate, which made it as one of the world’s best eco-tourism spots. Here is the list of the eco-tourisms in Sabah Borneo that you should visit during your Borneo tour. A centre that takes care of the orphaned and injured Orangutans for rehabilitation trained them to survive again before releasing them to the wild. You get to see Orangutans up close from the feeding platforms. There will be two feeding sessions – 10 am and 3 pm, it is best to arrive at the feeding platforms 30 minutes early. A new section open in 2014, which is the nursery area, you will be able to watch younger Orangutans playing around with each other through the large window at the indoor seating areas. A centre that takes care of the orphaned and injured Orangutans for rehabilitation, trained them to survive again before releasing them to the wild. You get to see Orangutans up close from the feeding platforms. There will be two feeding sessions – 10 am and 3 pm, it is best to arrive at the feeding platforms 30 minutes early. A new section open in 2014, which is the nursery area, you will be able to watch younger Orangutans playing around with each other through the large window at the indoor seating areas. Kinabatangan River is the longest river in Sabah, which made it an easy access to Borneo wildlife. For wildlife enthusiasts, you will be glad to easily spot some endemic wildlife, such as Pygmy Elephants, Orangutans, and Proboscis Monkeys, as well other wildlife such as Hornbills and other wonderful wildlife, while cruising down the river on a boat. Find out more on our Kinabatangan River Safari tour package. A hidden gem in Sabah, it has been documented there are roughly 75% of mammals in Sabah can be found within this forest reserve. So, if you are looking for a wildlife adventure, then this is the best place for you to go. Being driven around a Safari Vehicle around the forest reserve to have a chance to view Borneo wildlife such as Orangutan, Clouded Leopard, Pygmy Elephants and some of the iconic species that can be found in Sabah, Borneo. Check out our Wildlife Adventure Tour for a chance to seek Borneo wildlife in your Borneo trip. Kinabalu Park is one of the great places for you to go for a hike at any fitness levels. It is known for being Malaysia’s first UNESCO World Heritage site and home to more than 4,500 flora and fauna species. Kinabalu Park’s main attraction will be the majestic Mount Kinabalu – one of the highest mountains in South East Asia. Seeking for some adventurous activity in Sabah? You can try out climbing the Mountain via traditional climbing or Via Ferrata (iron road). If you are looking for other attractions that you can do in Ranau, read here. Sabah Tea Garden is the only organic tea farm plantation in Sabah and one of the very few left in the world, it is located in Ranau. You can get away from the city life and enjoy your trip to Sabah Tea Garden either for educational or leisure. Apart from that, you can experience the sprawling tea plantation which is surrounded by lush greenery of Borneo rainforest, as well as cooling air. Don’t forget to taste out Sabah’s finest tea and pancakes at the Tea House before going back! Planning for a holiday in Sabah Borneo is not only for those seeking wildlife and adventure, there are other things to do here too in Sabah, Borneo, than meets the eye. 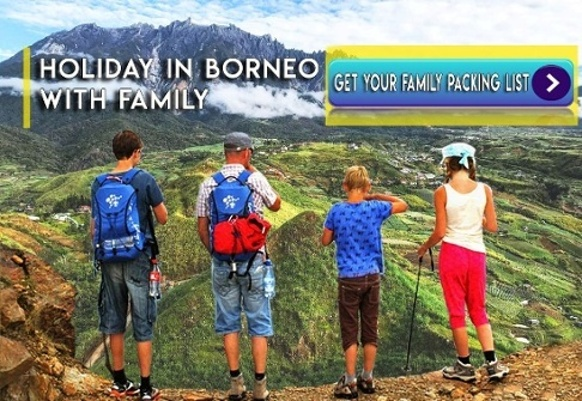 You can plan a leisure holiday vacation in Sabah, Borneo, as well as enjoy it in the capital city itself ;- Kota Kinabalu. Indulge yourself with the leisure activities for your Borneo escapade. No visit in Sabah without getting to know its capital city ;- Kota Kinabalu. Exploring the Kota Kinabalu city area, with its interesting attractions and landmarks, as well as the authentic lives of local villagers and villages. Take a look at our Kota Kinabalu City and Nature Tour package offered to you. Looking for an escape from the hustle and bustle of the city life? A day tour to Kundasang and Poring Hot Spring is what you need. Just a relaxing two-hour drive from Kota Kinabalu city towards the cooling breeze of Kundasang town. You will have a chance of getting a magnificent view of Mount Kinabalu ( depending on weather condition), a guided walk along the trail in Kinabalu Park, and also you can relax in the sulphuric mineral water at Poring Hot Spring. Contact us for more information on the tour. Weston is a small riverside town, which is surrounded by traditional Malay village and mangrove forest. It is considered as one of our Top 5 leisure activities that you can do in Sabah, as you will be enjoying a relaxing river cruise with your family or friends – to spot some of the Borneo wildlife and nature. In addition, you should not be missed out to witness the fireflies in the evening, which never stop to enlighten the spirit of visitors. To know more information on the tour, have a look at our Proboscis Monkey River Cruise tour. Another top 5 leisure activity that you can do in Sabah, is to chill and relax at the Sunset Bar Shangri-La’s Tanjung Aru after a long day. Be entertained with the soft chill music in the background and the sound of the beach waves lapping. Admiring the spectacular view of the sunset and don’t forget also to indulge yourself with a glass of cocktail or cold beer to provide satisfaction in your Borneo Holiday trip. Did you know, according to Huffington Post, Kota Kinabalu is one of the eight world’s best place to see sunsets? It is not a surprise at all. With its dramatic backdrop of brilliant scarlet skies, sail on tranquil seas, creating the most beautiful view of sunsets around Sabah, Borneo. You can join the North Borneo Cruise to enjoy the 2-hour scenic cruise in the evening around the Kota Kinabalu coastline. Apart from that, you can enjoy a sumptuous international buffet dinner, while being entertained by a live band performance. Joining this tour will grant you an unforgettable evening at the sea! Are you ready to discover the leisure activities in Sabah? Contact us now and we can help you to arrange your travel plan in Sabah Borneo! Or maybe you are looking for day trips in Sabah? Check out our other blog post “Top 5 Day Trips To Do in Sabah Borneo“.